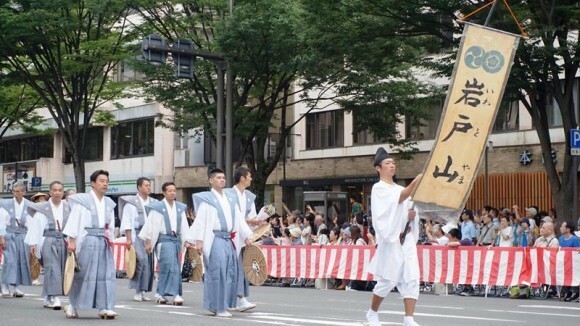 Sharing Kyoto's writers went to see the wooden floats of the Gion Festival, and ranked them! See which one got the first place. 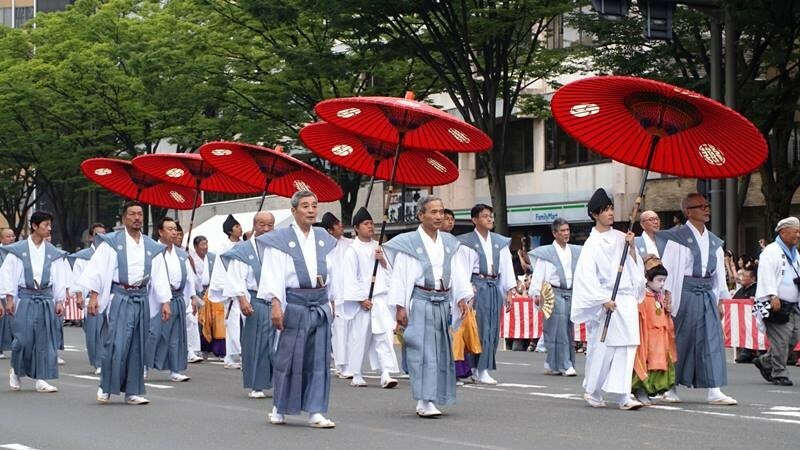 The Gion Festival (Gion Matsuri) is one of the most famous festivals in Japan. 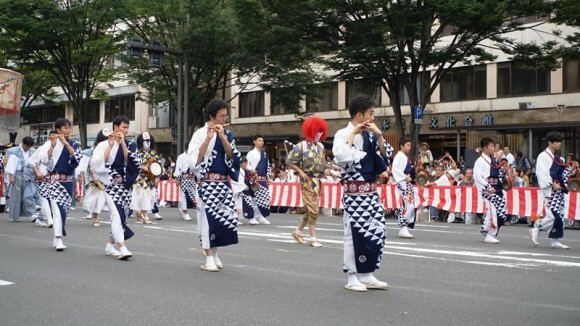 The festival is held over the month of July in Kyoto. As Kyoto enters the month of July, the unique sound of Gion Hayashi, music of the Gion Festival, can be heard floating down the streets of the city. This time I went to see the Yamaboko Junko, a parade of decorated floats held on July 17th. This parade, which features a huge variety of elaborately-decorated floats that traverse the streets of Kyoto, is the highlight of the Gion Festival. I’ll be introducing my personal favorite floats in a ranking format! Before we jump into the rankings, let’s take a look at the day of the festival. 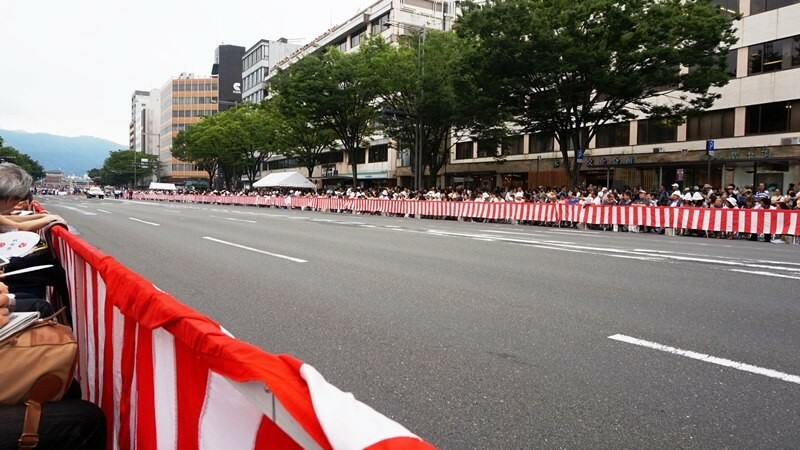 Although it was still only 9am, the area around Kyoto Shiyakusho-mae Station, a popular viewing spot for the float parade, was already filled with people! 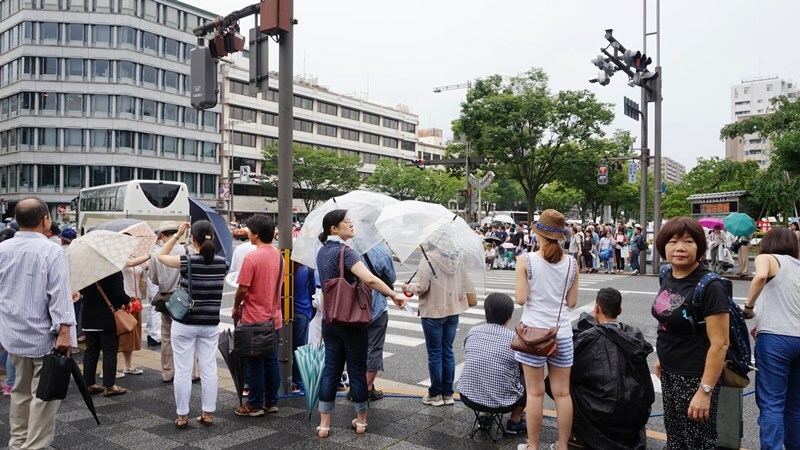 Sadly, it was a rainy day, but many people still gathered to see the parade. The Gion Festival float parades are held on July 17th and July 24th of every year. This year’s parade happened to fall on a Sunday, so there were more viewers than usual. Over 190,000 people came! As the time for the parade draws near, the streets are closed to general traffic. The floats run on the city streets during the festival. Everyone waited with excited anticipation, fidgeting with their cameras and flipping through pamphlets. I was also one of these many impatient onlookers, but, about 90 minutes after I secured my spot, the float parade started! A total of 33 floats participate in the float parade. 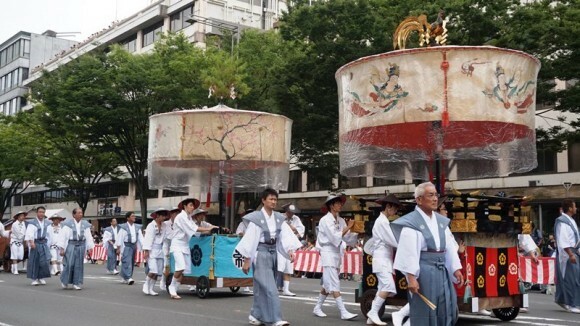 Out of these, 23 floats participate in the Saki-matsuri (former festival) held on July 17th. 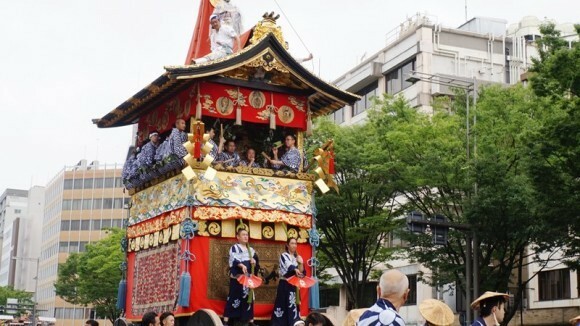 The other 10 floats can be seen at the Ato-matsuri (latter festival) held on July 24. I participated in the July 17th former parade, and I picked my 5 favorite floats out of the 23 to introduce to you here! Now it’s time for what you’ve all been waiting for! My favorite, must-see rankings of Gion Festival Yamaboko floats! This Hoko float proceeds in a slightly different manner. It uses an old format that precedes that of the current Yamaboko floats. What makes it unique is the large procession of people that line up in front of this float as it moves down the city streets. Another standout feature of this float are the children wearing orange-colored clothes. These boys are called chigo—they play an important role as “living gods” during the Gion Festival. I also saw festival participants performing with flutes and taiko drums while others spun rods and danced to the music. Men wearing read headdresses spun the rods round and round while blindfolded with white cloth! 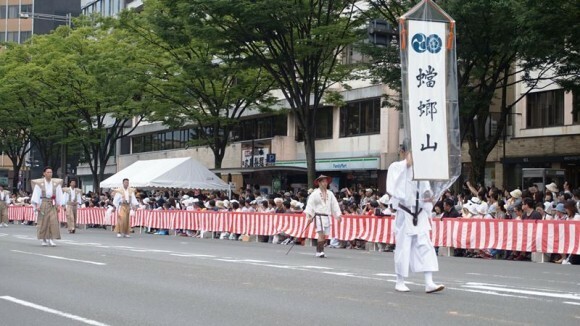 The main Kasaboko float appears at the very end of the procession. The float in front had a wood-carved chicken on its roof while the float in the back had a ornamental pine tree. The fabrics came in beautiful designs with a nostalgic, historic vibrancy. In addition to offering protection, the Ayagasa Hoko also offer fortune in enmusubi (matchmaking)! It seems that this float has tied the strings of fate for many relationships and marriages! What an amazing effect! Yamaboko floats are divided into Yama and Hoko floats. This float is a Yama float. Hoko floats are large with many men riding on them. Yama floats are smaller and each have their own unique features. 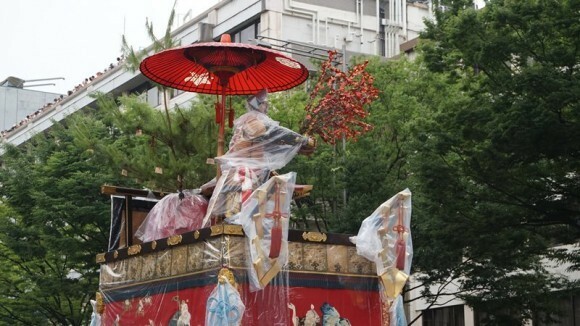 Usually, there are puppets called go-shintai (sacred body of the gods) riding on the floats. These puppets are actually quite romantic! The red flowers that these puppets hold in their hands are plum flowers. They are given as presents to lovers. For this reason, just as with the Ayagasa Hoko that came in at 5th place, these float are a said to bring fortune in enmusubi (matchmaking), making them a bit hit with the ladies. The Hosho Yama float, the most famous of these matchmaking Yama floats, was my 4th place favorite. Finally, it’s time for my top 3! Who will come in 3rd…? Ta-dah! The 3rd place float is the Naginata Hoko! Because of the large halberd attached to this Hoko float, this float is called the Naginata Hoko (Halberd Hoko). The float is approximately 20 meters in length—I was surprised by how big it was! You can’t see in the picture, but the actual float is much taller! Every year, the order of floats in the parade is decided using a lottery. 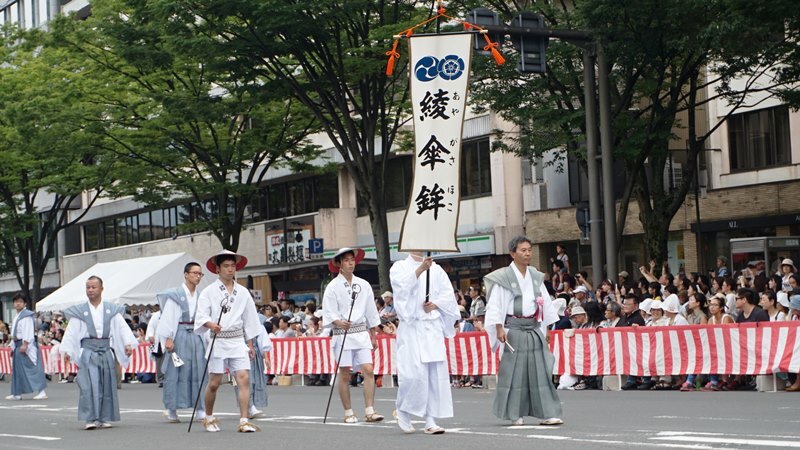 However, the Naginata Hoko is a special kind of Hoko float called a kujitorazu (no-lottery); it always gets to lead the parade every year. The Hoko floats each have different boys riding on top of them. Normally, a boy puppet is perched in the center of the Hoko floats, but the Naginata Hoko is a special Hoko float that has a real boy! The brilliant top batter of the parade, the Naginata Hoko, came in at 3rd place! Next is 2nd place! Who was our shining 2nd place finisher…? Coming in 2nd was one of the crowd favorites, the Toro Yama! The word toro means “praying mantis” in old Japanese. 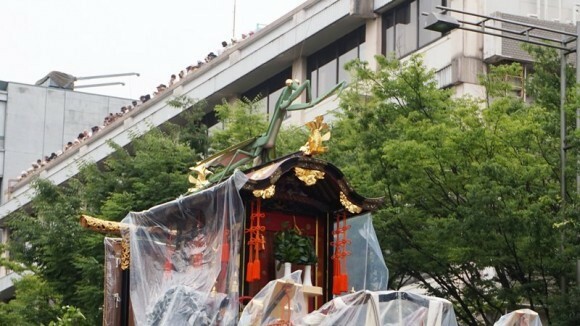 Before I went to see the Gion Festival, residents of Kyoto often told me, “You have to go see Toro Yama!” What exactly is the special reason for the praying mantis in the name of this float? As the name suggests, there’s a praying mantis riding on top! I was so surprised! The float’s theme comes from an ancient chinese fable that tells a story of how brave praying mantises stand off fearlessly against fierce foes regardless of their own strength. The mantis is difficult to see from far away, so try to get closer if you can. This praying mantis has a surprising secret. Actually, it moves! The most unique feature of Toro Yama is that it is the only mechanized float in the whole Gion Festival! The mantis’ arms actually move in unison with the sound of music! This is a big crowd favorite. There’s even a performance where the praying mantis’ moves its arms faster and faster when onlookers give it more applause. It was also really cute to see the praying mantis move as if to wipe the sweat off of the bodies of onlookers. The time has finally come! Which shone the brightest out of the 23 festival floats?! It’s time to announce the glorious 1st place finisher! 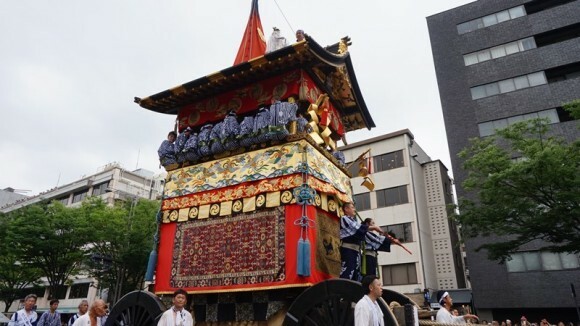 Although this float has “yama” in its name, it has wheels on it just like a Hoko float! The gorgeous ornaments on the Iwato Yama were just spectacular! The base design of the float is red, and the overlying golden fabric is a brilliant sight to see. 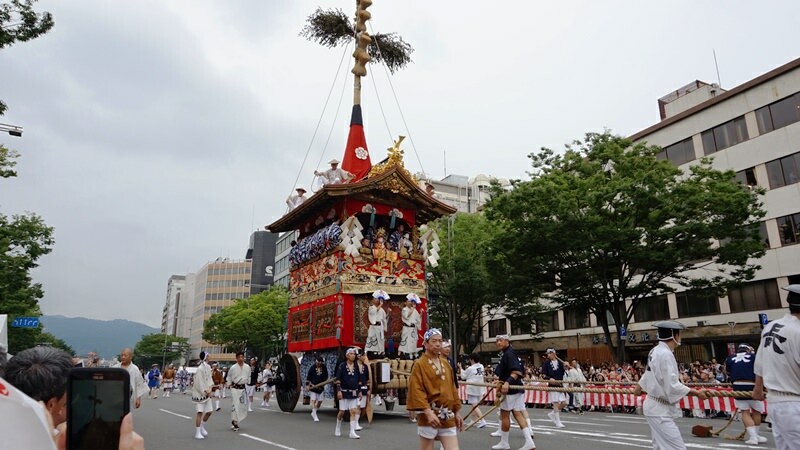 The Iwato Yama is a unusual float that has its puppet sitting on top of the roof. It seems this tradition originates from a Japanese myth. You can feel the history just by looking at it! In addition to offering protection, the Iwato Yama also brings good fortune! If you haven’t had much luck of late and are looking for some change, how about praying to the Iwato Yama? All of the Hoko floats including the Iwato Yama have large wheels, but did you know that the Hoko floats can actually only go straight forward? Because of this, it takes a huge amount of time and effort just to turn the floats around a corner. After all, it isn’t easy to change the direction of these heavy Hoko floats when they weigh over 10 tons! 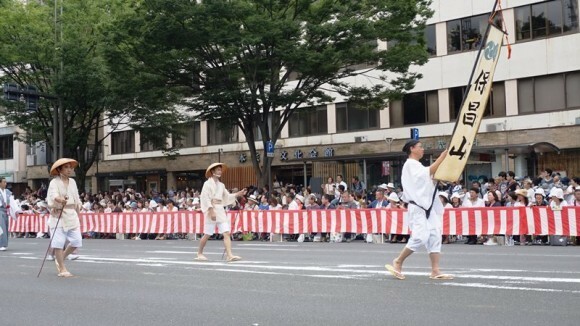 Changing a Hoko float’s direction is called tsuji-mawashi (turning of the floats). Around 40 men respond to a signal, synchronizing their breaths and pull on ropes in unison, gradually changing the Hoko float’s direction. Watching tsuji-mawashi is a popular part of the Hoko float parade, and cheers rise from the crowd every time the float moves. You’ve got to see it up close! This time, I went to see the “former festival” of the Gion Festival and chose my favorite floats to introduce to you. Each float had its own unique decorations as well as its own origin and meaning. They were so fascinating! It seems the locals all have their own favorite floats too. Some like to enjoy watching all the floats pass by. Others like to chase their favorite ones. There are many ways to enjoy the festival! This year’s Gion Festival is already over, but I hope you will visit Kyoto next year to see this beautiful float parade! 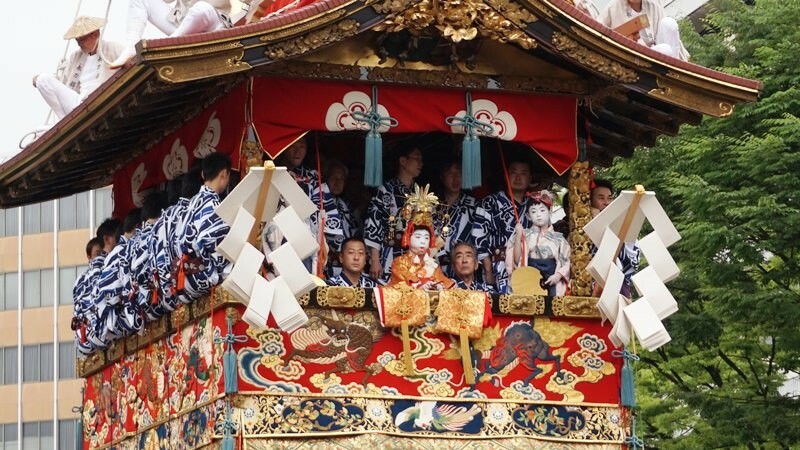 The Gion Festival is a month-long festival with a number of events and summer in Kyoto begins with the festival! Among these events, the float parade of the first festival is the biggest one and will hold your attention from beginning to end. 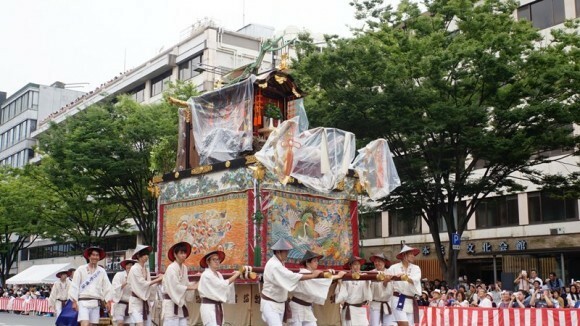 Though not present in this report, my favorite float is Fune Hoko, coming last of the procession. Unlike the other floats, it has a distinguished shape of a ship and I really enjoyed watching it setting forth powerfully on the street. Yamboko floats are known as "portable museums" for their gorgeous decorations and embroideries. Join the festival and find your own favorite float!